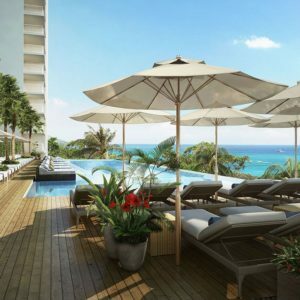 Hawaii’s newest urban resort destination, Alohilani Resort Waikiki Beach, is the premier cosmopolitan retreat for visitors to Oahu. Modern, stylish, and inviting, Alohilani is ideally suited for leisure, business, and family travel. Located 60 steps from door to shore, Alohilani Resort Waikiki Beach features 839 newly-redesigned guest rooms and suites which boast stunning ocean, Diamond Head, and city views. Other on-site amenities include a sophisticated lobby experience with lounge and bar; a 280,000-gallon indoor Oceanarium brimming with sea life; concierge areas, retail boutiques, and group arrival lounge; two restaurants from Iron Chef Masaharu Morimoto, including a tropical beer garden; a chic destination pool deck and bar with a saltwater infinity pool and private cabanas atop a reflecting pool overlooking Waikiki Beach; a separate kid’s club; educational and cultural programming inspired by Hawaiian culture; and newly renovated meeting and social event spaces. The resort is also within walking distance to exciting outdoor activities, exciting nightlife, and world-class shopping. 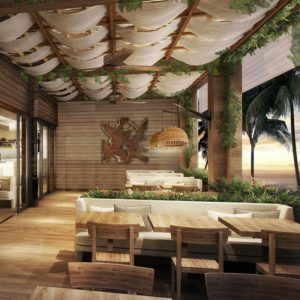 Alohilani sparks a new vibe on Waikiki Beach, blending Hawaii’s proud cultural heritage with an elegant and contemporary style that’s uniquely… Aloha Chic.